On October 20, 1858 the shadow of the first frost crept across the floor and pulled a secret from John. A secret he had thought to leave across the ocean. “Tricky little things,” he said, feeling dazed as he lit his pipe. The children looked up to see him staring in an odd way at the fireplace behind them, and they hushed arguing over their checkers. “A happy kobold brings good luck and wealth, but a resentful one...” Smoke rolled over the rim of his pipe in a wave. “In the old country I saw them as old people, or feathers, or cats, or stripes of fire.” His hand absently pulled a pocket watch out of his vest pocket. “They covet silver. My father mined this silver himself. He tricked a kobold out of it by giving it to me.” The children looked at each other uneasily as he blew a smoke ring. He rubbed the watch back and forth. Back and forth with his thumbnail. “That kobold tricked him back with a vein of cobalt. Stuff looks like silver, but it poisons those who touch it.” He tore his eyes from the fireplace and regarded the children huddled together in their flannels on the hearth. “Have I been speaking out loud?” He rubbed the watch once more before pushing it quickly back into his pocket. “That was long ago. He shouldn’t have been so stubborn about putting the beer and bread on the hearth every night.” He turned away. The children looked at each other, read in each other’s eyes the resolve not to make the same mistake. But soon after little William didn’t leave out the bread and beer for an entire week. Caroline begged him to do it between fits of coughing, but he couldn’t make himself leave her side. He huddled next to her and read her books until they both fell asleep. After a few days, she held his hand instead of begging. After a week, they stared at each other with wide frightened eyes. Something had gone terribly wrong. On a gray May morning more than one hundred years later Leigh Pearl brooded at the top of the Windward House stairwell, worming one finger through a worn spot in her jeans. Down in the kitchen her older sister Olive hummed as she moved the burbling coffeepot off the stove. Leigh folded her scrawny arms and stared at the faded wallpaper until the smell of fresh biscuits drove her down the stairs. She reached for the fattest one still steaming atop the stove. “I still hate you.” She glowered at Olive who now sat between towers of magazines at the table, stretching across the room with all of its company leaves inserted. An old man poked his head out and surveyed the brown water running beneath his stoop. “Olive still crazy up there?” he asked as his white beard unfurled and puffed out in the breeze. Olive had dropped out of college to fix up Windward Place after the funeral. So far she had managed to patch and repaint the front porch and the swing, which gave the old farmhouse an odd wincing grimace. “Yesterday she didn’t even stop to make lunch.” Leigh handed Dago the peacock feather and two nicely browned biscuits. He tucked the feather into his neat white braids with the others. “Where’s the honey?” He examined her face. “Ah. I see you two are fighting again.” He reached for a long stick leaning against the cabin and measured the level of the river. “Normal for this time of year,” he announced, watching the markings on the stick. The shade darkened under sycamore leaves as big as plates. “I hate the smell of paint.” Leigh skipped a flat rock across the rain-dimpled river. “Improvement that, improvement this,“ Leigh groused as she watched columns of mist skim the river’s surface like warnings. “And not just the house. Don’t forget that hoity-toity leg specialist to improve me too.” She slapped at her bad leg. “It’s just fine. I’m just fine.” Up the river wild peacocks bawled in the mist and more wind blew through the sycamore leaves making them clap. “I’m goin’ crayfish huntin’.” Leigh pushed her messy curls back into her headband with one damp palm. Leigh followed his glance. The specialist had ordered her to be less active on it. Not stress it out. Not that he hesitated to poke and prod it. She shrugged. Dago took out his pocket knife and cut off a piece of biscuit thoughtfully. The stigma of Windward House wouldn’t disappear with a few licks of paint. That would be like expecting Leigh’s limp to heal if they hemmed up one leg of her jeans or fixed her shoes. He stooped to dump rainwater out of his rubber boots. Everyone called Leigh’s grandfather Dago even though he was full-blooded Potawatomi Indian. He shrugged. “That woman was a saint to take care of you.” He smiled to lessen the sting and added, “We’re all a mess here at Windward Farm. Your mother managed better than most of us.” He looked hard at her. “Right now I’ve got to manage me some goats.” He patted her head and went up the path to milk the wet goats. Leigh watched his white braids bristling with feathers disappear over the rise. She heard the goats bustle and bleat in greeting. With a toss of her curls, Leigh made her way down the muddy path to the massive gray rock teeth which jutted up around a large oval of water as if the bank reached a protective arm out into the river. She pushed up the hems of her jeans again and tossed her shoes. The specialist and his stay-out-of-danger warnings could just go to hell. Along with Olive. And her father. And her mother too. And all of the rest of the stupid family ghosts. Nothing but good-fer-nothings or weaklings or worse. She gritted her teeth at the icy cold. Cold mud and layers of mushy winter leaves rose to her ankles. Icy water lapped, sometimes brown, sometimes green, sometimes with shards of mirror as one caught a piece of sky. If Olive would just stop messing around with the poor house and pestering her about school, she wouldn’t be have to be down here in the water just yet. Suddenly, she realized that the birds had stopped singing. She froze. Sometimes she saw ghosts in the columns of mist. If she held still. No. The birds held quiet for another reason. Up along the road she heard a faint mosquito whine grow louder and louder until it stopped with a small whuff and a bang. “Figures. I know that sound,” Leigh told the birds. “You can go ahead and sing.” In her mind a picture formed of an old woman hopping off of a red moped, kicking at the kickstand with her shiny red shoes, and pulling her giant red leather purse out of the wire basket on the front. Leigh sat on the rocks around the cold fire-pit to fold her jeans back down over her spindly leg. The same fire-pit where Dago smoked his Indian pipe and told stories now and then. People tell many strange stories about the Pearl clan. The Pearl clan tells these same stories from a different angle. The most-told legend of grandma concerns her disappearance from grandpa’s funeral. Afterwards half of the town arrived at grandma and grandpa’s house and milled together with their plates loaded with the wedges of pie and cut vegetables which had magically appeared on the counter. “Have you seen my mother?” Deryl interrogated everyone as they came through the door and wiped their feet. “How could she miss her husband’s funeral?” After she spent frantic hours pestering the police and the pastor and Bernard, grandma walked through the front door brandishing a thick metal key and smiling. She put her hands on her hips and told them about buying some old haunted house from the bank for $3,000. “I only had to pay back taxes,” she said with satisfaction. “The bank’s been saddled with the estate for years. In all that time only one other serious buyer came from Chicago. She took one look at the place and drove away so fast she didn’t even claim her key deposit. Lucky for me.” Merga ignored the head shakes and eye rollings and insisted, “I’m going to solve the mystery. Your Father and I had it all settled before he died.” She walked firmly around the living room and showed the speechless crowd her key. Leigh rubbed a bit of mud from the hem of her jeans and chuckled to remember Dago’s imitation of grandma Merga’s voice. She hadn’t seen her grandmother for three years and so she found herself climbing the path eagerly, her muddy feet and wet pant legs slapping along in an uneven rhythm. Anyone familiar with Windward House entered around back through the mud room, a short hallway lined with wooden pegs. They would use the rugs to wipe their feet dry and the benches to switch their dirty, earthy clothing for a robe or clean socks. The mud room emptied its newly clean guests into the kitchen, dominated on one side by the black woodstove and on the other side by the door of a pantry with smooth wooden countertops and lots of tiny drawers. That room was the pantry where all the Pearl babies had been born for the nearly one hundred years since Leigh’s Great-Great-Grandfather Adam Pearl had built Windward house. Even lame Leigh had arrived into the world there. Light sliced across the pantry floor through one tiny window. An odd window for an old farmhouse. Carved animals, silver spoons, brightly painted toys, and silk scarves hung around it in an exotic skein. Grandma Merga’s world traveling remnants came to rest here, in and amongst the dried bunches of herbs and the washed piles of early radishes and peas. Everything but a strand of lucky beads. grandma Merga Bien, called Zebra Lady behind her back, ignored the mudroom entrance at the back of Windward House and knocked on the front door of the house like a queen. Back when she had been a regular person - a school teacher and church-goer who dressed like everyone else - Leigh’s Grandmother Merga Bien had lived across the road. After her husband died of a stroke, her son went missing in World War II and finally her daughter, Leigh and Olive’s mother, died tragically, Merga sold everything and went to find herself. Her real self apparently adored zebra stripes and shiny red things and traveling the world. The screen door creaked in the rainy breeze as Leigh and Zebra Lady regarded each other. Grandmother’s shiny red shoes padded into the kitchen where Olive still sat at the table now covered with newspaper and paint cans. “But this color will make it so dark!” Olive drank her coffee and argued with the ceiling. One half of Olive wanted to knock out a wall and modernize, but the other half thought it best to restore things. She patted the bandana over her short hair with one hand and stirred paint with the other. Leigh stuck her tongue out at her back. Grandma Merga put one arm around Leigh with a hard squeeze and announced, “Well, that’s it then. I’m done traveling for a while.” Olive turned with a yelp as Merga tossed a great pile of linen black and white napkins with embroidered fleur-de-lis on them onto the only bare spot on the table. “Got those in Paris at a flea market for you. Tried to fit your modern and your traditional yearnings. Seller claimed they once belonged to one of those King Louis characters.” Olive leaped into a tangled hug but Leigh held back, listening to the tree frogs chorusing and the red winged blackbirds whistling on the fence. “I can’t believe you’ve been gone three years!” Olive laughed. “I so missed you.” Leigh stood back and crossed her arms. In a moment they turned to look at her with quiet glances at each other. Obviously they had already discussed something on the phone. And decided without even asking her. Dago banged the screen door open with one plaid shoulder and peaked into the kitchen. He shrugged at Leigh’s suspicious glance as he peeled off his boots. “I had nothing to do with it.” He picked up fallen diagrams from the floor. “Nobody listens to an old Indian anyway.” He waved the diagrams as proof. “Humph,” answered Leigh. Grandma Merga shrugged and backed her coupe around the potholes in the driveway. Dago tipped his cowboy hat at Leigh from the middle of the goat field. Although Merga had purchased her haunted house long ago, she had rarely lived in it because of her travels. Leigh had heard of the house from Wally, but she had never seen it. The red coupe flew past newly-planted fields to Winona Lake. They drove under the viaduct and past the trimmed bushes spelling out Winona. “Darned near the only thing that still looks like it used to,” Zebra Lady commented with a wave at the bushes as they crossed the bridge to the island. Leigh hadn’t left Windward House except for doctor visits and church, so she blinked in surprise at the huddles of swans and geese on Winona Lake. She couldn’t stop a smile at the ancient willow and the huge faded red house ringed with sagging porches. Of course it would be red. At least it wasn’t zebra-striped. Leigh saw stacks of books through the porch windows as they pulled up. The mammoth house stared back at her with high stained glass windows like painted eyes. Zebra Lady’s famous haunted house. They sat in silence as the red coupe sputtered in the short driveway as the evening faded to blue and a light wind pressed leaves against the windshield. “Come in.” Grandma Merga turned to her. “Oh and this is for you. Guess it won’t get into the pantry with the rest now.” Merga extracted a tiny silver Eiffel Tower from the depths of her red bag. “Found it in a jeweler’s shop. They really should mass produce them. Lovely isn’t it.” She shifted her giant bag out the door and leaned back in. “Pretty sure it didn’t belong to any ancient kings though.” Leigh turned away. She would not be bribed. She wanted to spend the summer splashing in the river at Windward House and training her goats. Not cleaning up some dusty old house while tutoring with an ancient school teacher, even if Wally claimed that she was a witch. A witch. Not likely. Leigh settled her pink suitcase on the rug inside an elegant dark-paneled vestibule. No wonder Zebra Lady avoided the messy old mudroom. Grandpa Bien’s large oval portrait hanging over a mourners bench stared at her. The portrait must have been from his days as a principal, long before he retired to become a farmer. Long before he had climbed the fated windmill. Long before Leigh had been born. “Leigh, meet Blitz,” Grandma Merga interrupted her thoughts, breezing in as a black and white blur popped out climbed Leigh’s jeans with sharp kitten-claws. Leigh winced. “Not that leg, you doofus.” She plucked him into the air by the scruff of his neck. Blitz pawed at one of her curls. She shook a finger at him. “If my doctor knew you were mauling my bad leg…” She tried to cradle him, but he licked her fingernail with distaste and leaped to the ground. “Your grandmother is a sensitive,” Dago had once told Leigh as he carved himself a pipe. “Smart as a whip just like you and she hears things that most people don’t.” He blew some slivers from his beard. “Sees things too. You might have that gift. If you stop all the noise of feeling sorry for yourself.” Leigh had pretended not to hear him. Everybody round about Winona knew the gist of that old newspaper article. It wasn’t often that reporters from Chicago wrote stories about little Winona Lake even in its past life as a famous resort. This story had taken up two full pages telling the haunted tale. Still now, fifty years later, local lovers came at the full moon to walk around the place three times backwards and kiss for luck. Some believed that the former owner, William H. Bruning, had buried treasure somewhere in the house right before the great Wall Street crash in 1929. Several neighbors claimed they had seen a ghost in the upstairs porch. They locked their doors at night and kept their cats inside, especially when Merga traveled and the graffiti carved boards hung back on the windows. Leigh thought this all bunk. She lived in a haunted house already. Another one didn’t impress her. Leigh opened her fist and stared at the tiny Eiffel tower, then stuffed it into her pocket. She turned her back upon her Grandfather’s stern look and touched a hand-embroidered handkerchief sticking out of a box in the next bookcase. Merga ate her own ham and mustard sandwich while leaning against the counter. “Those handkerchiefs belonged to Nelle – you’ve heard the story about William and Nelle? Our ghost likes to move them around now and again.” Leigh thought with a smirk, more likely that kitten. But she did note that her grandmother had said our ghost. Merga pushed a few potted ferns and some notebooks aside to make more space on the table. Unlike the antique living room, the modernized kitchen had been turned into a zebra shrine. Black and white towels. Every other cabinet painted black or white. Tiny prancing zebra magnets on the fridge. Leigh grimaced. “You sure do like zebras.” She wolfed her own ham sandwich down and licked her fingertips to pick up the crumbs. She had long tired of cream-of-mushroom-soup casseroles from her sister Olive’s Betty Crocker cookbook during the painting phase and before that from the funeral food. Zebra Lady looked pleased that Leigh had noticed the decorations. Grandma Merga carried the pink suitcase up the open stairwell to Leigh’s new bedroom and pointed out a ladder with one elbow. “Hope you aren’t superstitious. Miss Phoebe won’t have it in the attic and this is the only ceiling high enough left to store the thing.” She bumped Leigh’s forlorn pink suitcase up on the bed and frowned at it. “You’re getting too old for pink. We’ll have to find you something proper.” She worried the suitcase zipper loose from a tee shirt tab hanging out and turned back the coverlet. Leigh smiled that her Grandmother didn’t offer to help her up onto the huge bed. And thank goodness there was nothing black or white striped in the room either. But who was Miss Phoebe? And what was she doing in the attic? Merga puttered around the room, rubbing dust off of a crystal sitting on the windowsill and pulling open drawers and sniffing. “I burned some sage in here this afternoon so you shouldn’t be bothered by any ghosts tonight.” She ignored Leigh’s snort. “Now that I’m home, I aim to figure our ghost out.” Leigh felt a stab of interest. Maybe they wouldn’t be spending the entire summer with erasers. She didn’t answer. Probably a trick to lure her into some dusty old library to study. “Would you like me to tell you what I know already?” Merga frowned at something in the corner. Leigh turned her face into the pillow in silence. “I’d best stop tittle-tattling... Shoo now. Shoo. Miss Phoebe. There’ll be plenty of time tomorrow to meet our guest.” Her Grandma disappeared out the door. Leigh’s fingers ran across the indentations on her check from her Grandmother’s ever-present gold locket and crystals. She stared at her bedroom ceiling, thinking about ghosts and leg operations and silk scarves and crazy grandmothers. Shoo, Miss Phoebe? “Hello?” she called tentatively. Nothing. She couldn’t sleep. She stared out at the island as lights winked out one by one. She pulled out the Eiffel tower again. Wonder how many steps to the top? Her bad leg could never climb that far. She set it down next to the crystal sitting on the windowsill. That woman sure did have a thing for crystals. “She’s a witch, see I told you,” she heard Wally murmur in her head. “Are you up there, Mom?” Leigh asked the night breeze which pirouetted the curtains gently. Not just any air, purportedly haunted air. She breathed it in, checking to see if it felt thick or alive. At home, the air near the river felt different. She noticed nothing here. Bunk. That’s what her mother said about ghosts. Bunk. In the dim light she saw a small desk holding a notebook and cup full of sharp pencils. She hadn’t drawn anything since her father’s funeral, but she threw her legs over the edge of the bed and chose a pencil. She tested the tip on a pad of paper but her fingers felt dead. The pencil grip felt wrong. The paper too coarse. She flung everything on the bed and looked back outside. Across the street a wren popped in and out of a broken spot in the plastic tail feathers of an owl nailed to the fence. Dago had carved a few of those fake owls to scare off small pesky birds and squirrels. His looked more realistic. The wren hopped onto the plastic owl’s head and trilled to the dusk. Trilled a bubbling and complicated series of almost-words. The dusk rumpled them or maybe they bumped into fireflies on the way across the road. Or perhaps Leigh just didn’t know how to hear the right way. Or breathe the right way. Probably because Olive was right and she was just uneducated and stupid. A shiver crept down her spine at the thought of public school. She envisioned herself shuffling down a long hallway lined with kids staring at her leg. Like they did at church. She opened the window wider. As the air flowed in, the wren tried again. This time his song sounded like a eulogy. She picked up the pencil and paper from the quilt and sketched the old owl and the fence across the road and the small brown wren. Now she felt something else. Something different in the air. She shrugged off the question of whether the something represented her mother or her father or some Merbrink ghost or just her own imagination. She took a deep breath. Salty or spicy. Well, something. And then something slid under the door with a slither. Her stomach leaped and fizzed. She squinted at the shadows, but no further slithering sounds came and she gathered the courage to pull the chain on her bed lamp. A yellowed newspaper clipping peeked under the door. 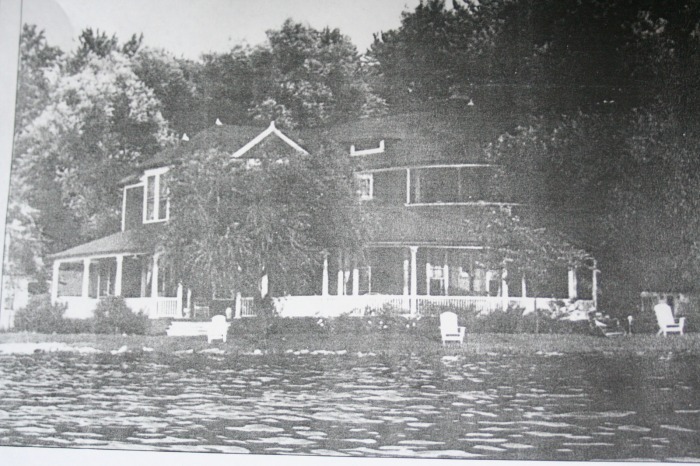 Under the willows that feather Bruning's Point," on the shore of Lake Winona, stands "The Mystery House" with its doors locked, and its windows sealed. "It has stood so for fifteen years, waiting for something," say the cottagers of Winona Lake, the little Indiana resort town. They are told this “something” is a "bride." They have never seen within the house and never expect to. They get the story from the carpenter, the plumber and the piano tuner, told when they returned from their thrilling assignments. These men brought back the heart-stirring information that the house was completely and lavishly furnished, that tinder and logs stood on the hearth, ready for the match, that a silver service for two sat on the dinner table, that two leather chairs waited under a reading lamp, that the piano stood, top lifted, keys ready for human hands; that two sleeping rooms had beds made, combs and brushes on chiffoniers, slippers laid out, everything arrayed for occupancy. "And," said the favored artisans, "One of the rooms is for a woman, because it has dressing tables covered with these slim, ivory backed things that women use for their hands and hair." The townspeople know that W. H. Bruning, the wealthy President of the F. J. Bruning and Son Company, spice and tea, wholesale merchants of Evansville, Ind., and New York, started building the mysterious mansion in 1903, calling it "Merbrink" and that twice every month since, he comes back to visit. No one has ever spent a night in the house. The week-ends in Winona Lake he spends in the "Swiss Terrace" Hotel, which is managed by Mrs. John Cooper and her daughter, Miss Nelle Cooper. Only within the last year has this every two week ceremonial been discontinued, the failure of Mrs. Cooper's health causing the daughter to remain at home while Mr. Bruning makes his pilgrimage to the closed house alone. Bruning, immaculate, impressive, now bears seventy snows in his thick hair without bending. His charities are as numerous as his words are infrequent. Reputed a millionaire, his gifts to the religious organizations of Winona Lake have borne out in fact, the impressions of his kindliness. And when the women lodgers at "Swiss Terrace" grow confidential with Miss Nelle Cooper and helpless before their own burning curiosity, seek to gain the story from her, she avoids any answer with the sweet, serene smile that has earned for her the title "the best loved woman in Winona." Forty years ago John Cooper, an educator of New York, although no longer a young man, followed the Greenley injunction, then quite popular, and came West. He brought with him his wife and daughter Nelle, then a girl of 18. Evansville, Ind., recognized his worth and made him superintendent of schools. For some three years John Cooper lived so, his family happy and the way clear before him. Then his health began to fail and his wife and daughter sought to stem adversity by taking boarders. Among the first boarders to come was W. H. Bruning, a bachelor of 30, and partner with his father in the town's oldest tea and spice store. He loved Nelle Cooper from the first and she loved him. But something interposed. At any rate she went with her aging parents to Winona Lake in 1895 when Mrs. Cooper decided to maintain a hotel at that resort, then opening for its first season. A year passed and John Cooper died. With the widow and daughter, Bruning grieved as a son, and to aid them in meeting the world he built a magnificent cottage, capable of housing some hundred guests, named it "The Swiss Terrace," and installed in it the two women as proprietors. That same summer Bruning bought a lot on the point where the bathing harbor curves out to the more rugged shoreline. For weeks the place teemed with dredges and drays, as he built out and filled in making "Bruning's Point." He created a new acre and imported carpenters. On plans which he himself had drawn up, they began the erection of the fated house he called Merbrink. Into it went the best timber, the most ultra-modern conveniences. In that economical day it cost more than $10,000 which made it the show place of the town. Bruning lined the weatherboarding with mineral wool and bottomed its chimneys with wide fireplaces. Cheval mirrors, chandeliers, thick Brussels rugs, insignia of luxury in those times, filled it. Art went on its walls, a bluish gray scheme of color, subdued and beautiful, ran through its living rooms. Twenty-one rocking chairs are scattered through it. Gas lights were ready, fires were laid on the hearths, and a magnificent silver dinner set was placed beside rare china in the cupboards. Why Miss Nelle never came down to take Merbrink, now known to have been meant for her, is known to none but herself and Mr. Bruning. They gave no explanation. The lover's attitude announces this to the world, although he makes no reference to it. He brings at each trip (and he has never in all of these years missed his regular bi-weekly visit) a box of candy, presenting it to Miss Cooper with the manner of the story book swain. He allows no decay to creep into "The Mystery House." Each year he hires someone to paint it anew, to tune the piano, to examine the water and gas pipes and to replace any loose boards. Twice in the fifteen years new draperies have been carried in. The house is as ready today for occupancy as when it was built. The stone sun-dial which Bruning set up on the lawn a few years back is kept in as perfect alignment as though there were owners to run out from the house at any moment to note upon its face the progress of the day. He has the grass mown weekly, and the snow and sleet cleaned from the wide veranda. When the waves cast driftwood over the concrete wall which Bruning built against the blue lake, the caretaker carries the wood away as though a lady from the house within might open her eyes in the morning and be offended by the litter. One thing and one only betrays time's flight. The names and carvings on the planks that board the windows. These boards are thick and stout, for curiosity seekers constantly pry at them, striving to see behind. Over them are scores of lovers' names, written and carved. In summer the boys and girls wander down to the point and hand in hand circle "The Mystery House" or sit on the veranda steps. There has never been a "No Trespass" sign on the premises. At least three times these boards have been replaced so whittled were they by the knives of young lovers, carving entwined hearts, linked names and all the lazy, dreamy, totem-pole symbols to which aimless-youth-in-love is addicted. What irony this is, graven on the house that waits for love, can only be told by the man and the woman, if indeed, they ever tell at all.